In my new world as a worker bee, any dish that makes a good dinner and a better lunch is a dish that is immediately added into the rotation. 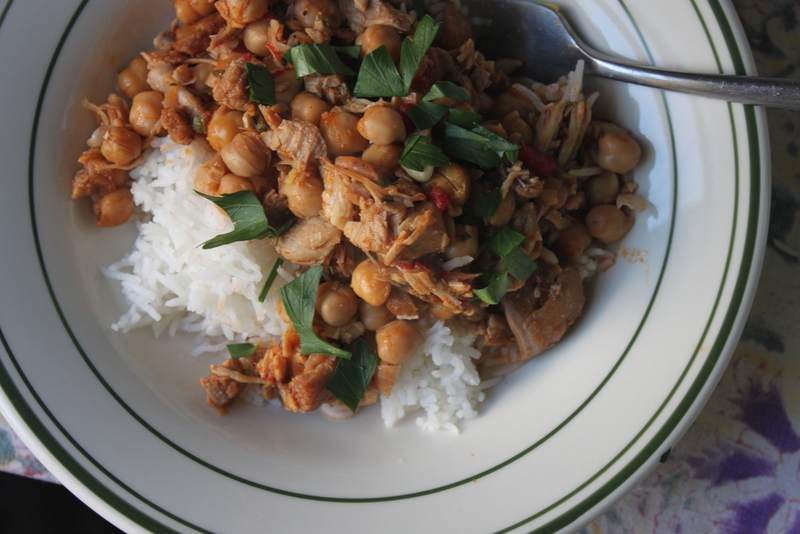 Lebanese chickpea and chicken stew. Roll that around on your tongue for just a moment. Imagine those flavors. Now imagine those flavors once they’ve had a chance to congeal in the fridge for a night or two. That’s right. It’s even better. And bonus points for every gasp of envy and admiration from your co-workers. In a separate pan, heat your 3 1/2 cups of water to just under a boil. Wash and pat dry those thighs, and season AGGRESSIVELY with salt and pepper. Coat the bottom of a heavy saucepan or Dutch oven and heat on medium. Add the chicken and brown until golden. (tip: let them sit – just sit – for 4 or 5 minutes without moving them. Then turn them and do the other side). Remove the chicken from the pot onto a plate and set aside. There will be chicken bits on the bottom of the pan, and that’s a good thing. Turn off the heat for a minute. 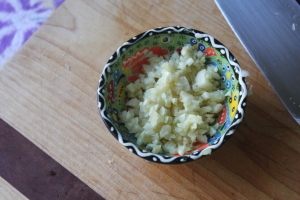 Your garlic will burn if you don’t. Turn the heat back on, add garlic. Saute until fragrant (a few seconds) then add your tomato paste, pepper flakes, cumin and sumac. Stir gently until you have a paste. Add your half cup of wine, making sure to incorporate all the chicken bits into the sauce. Cook gently for about five minutes. Add your heated water and a pinch of salt (hint: if you’re not using wine, add 4 cups of water). Add the bay leaves. Add the chicken back into the pot. 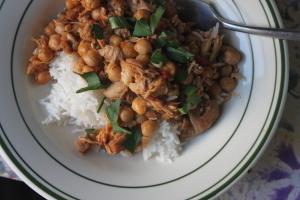 Bring to a simmer, then cook on low for about 20 minutes or until chicken is tender. Transfer the chicken to a plate to cool a bit. 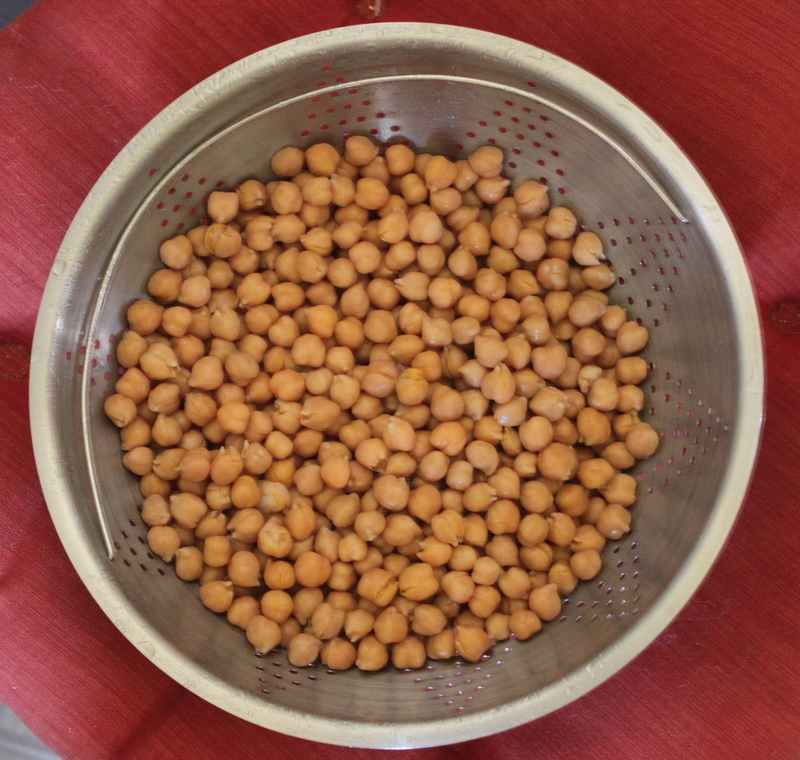 Add your chickpeas. Cook for five minutes. Shred your chicken (I just chopped it up). Add it back into the pot, along with the red peppers. Check for seasoning. Remove from heat. Drizzle with olive oil. DON’T FORGET TO ADD LEMON JUICE! You will thank me. Oh yeah and your parsley. I threw this over rice, but I imagine it’s good over cous cous or even awesome by itself with some quality crusty bread. Best thing: It’s even better the next day. Sounds delicious, especially the sumac. Where else have you used the sumac? I worry if I buy a bag it won’t get enough use. I use Sumac on everything…eggs, greens…It’s a fruity spice you’ll love…just buy the Sumac!